EAGLES NEST is a 98-foot motor yacht with a crew of four. EAGLES NEST is fully air conditioned and accommodates up to 10 guests in 4 cabins (3 cabins with Queen berths, and 1 cabin with 4 twins). After using their free weights and treadmill, you may wish to relax in the ondeck jacuzzi. EAGLES NEST's normal 5-night rate is $41,667 (plus all expenses) which is a savings of $8,333 from the standard weekly rate of $50,000. How nice is that! 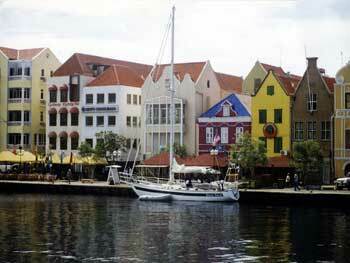 Plus, if you pick up and drop off in Nassau, there are no delivery fees. The charter yacht True North, a 65-foot Privilege catamaran, has lowered their rates by $5000. This is not only for the summer, but for the winter 2010-11 season as well. 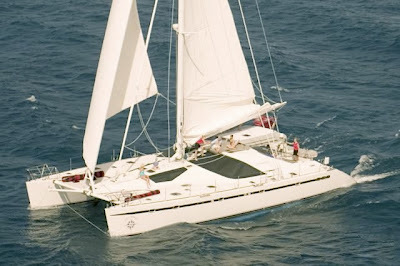 Catamaran True North : Caribbean Sailing Vacations & Diving too! True North is fully air conditioned and accommodates up to 8 guests in 4 guest cabins, each with ensuite heads. 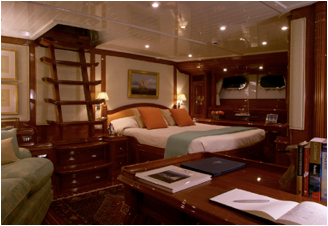 The master cabin has a centerline king bed, and the other 3 guest cabins are queens. Scuba diving is available for certified divers at no additional charge. The charge for scuba instruction is $250 for Referral Open Water Course and $150 for a Resort Course. True North has 8 sets of regulators and gear, including 14 tanks and a dive compressor. TRUE NORTH is available for June & July in the BVI, St. Martin, St. Barth's, Antigua or further south. Available during August in the Grenadines. 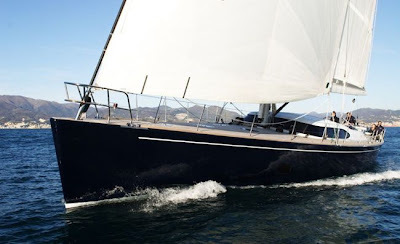 True North is available for a Christmas charter ending latest on December 26th. 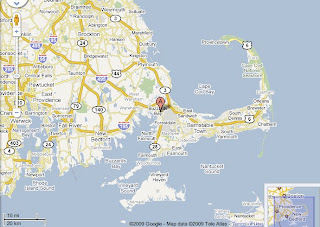 We just received an email from Phil & Laura of Storm Petrel to let us know that they have arrived safely in Massachusetts. The trip from St Thomas, US Virgin Islands to MA only took ten days... Good going, guys! DAYSAILS: Bring your lunch & drinks. Cooler and ice provided! Storm Petrel's base is in Buzzards Bay, so Phil likes to pick up at North Falmouth, near the Bourne Bridge. Phil is from that neck of the woods and has an incredible amount of local knowledge about this area. It would be a fun trip. Perhaps a 4th of July charter... Newport Jazz or Folk Festivals... Labor Day... Summer BBQ??? 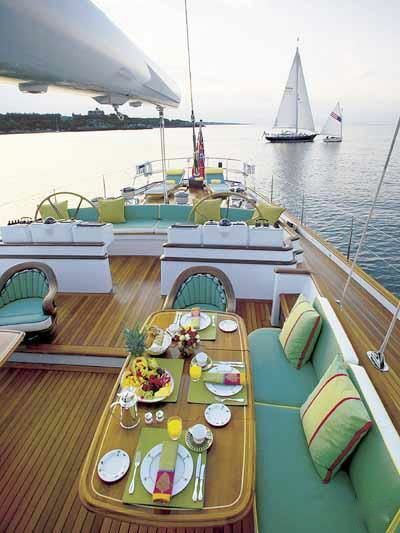 As you long-time readers are aware, the charter yacht PROMENADE, a 65-foot trimaran that accommodates up to 10 or 12 guests, is one of our favorite boats. 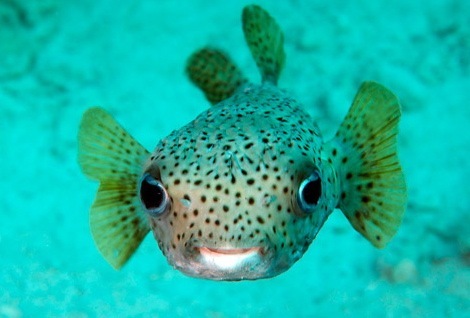 We'd like to share this really cool photo that Kerry took the other day of a puffer fish. PROMENADE is still available for a Christmas charter through December 27th. 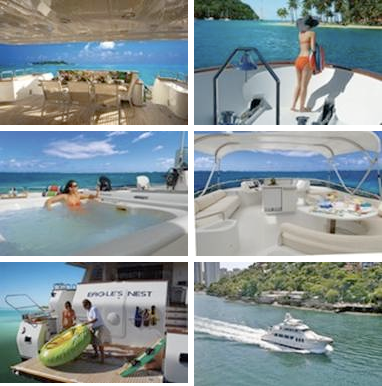 Book quickly because the big boats don't last long for the holidays! 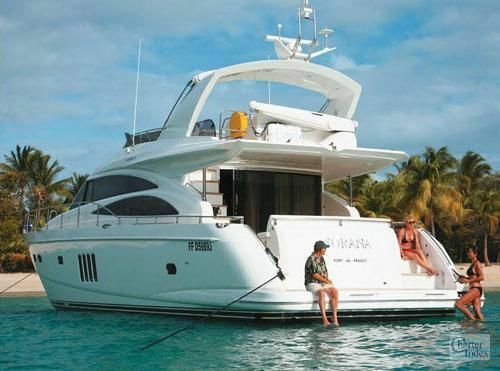 The charter yacht SORANA, a Princess Flybridge 67 motoryacht, will be available for charter throughout the summer in the Caribbean. 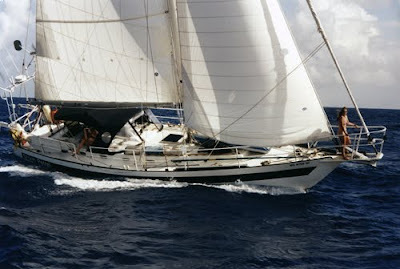 Sorana's summer homeport is in Martinique, although other Caribbean charter locations such as the Grenadines are available. 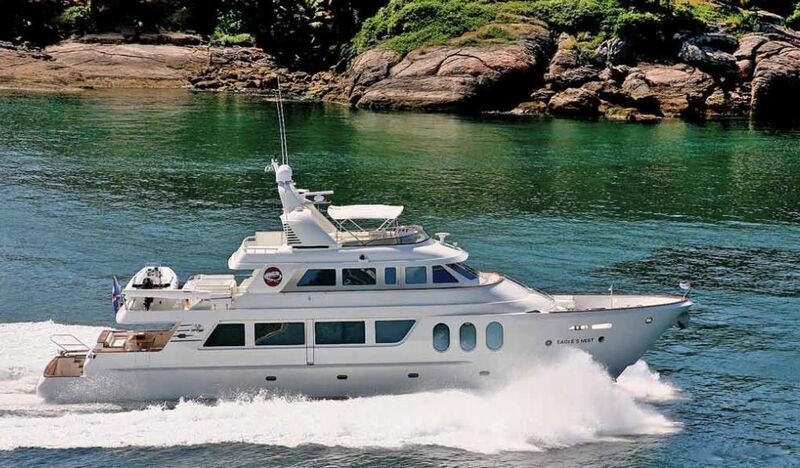 SORANA is fully air conditioned and accommodates up to 6 guests in 3 cabins: one queen, one double, and one twin cabin that has two lower single berths (NOT upper/lower bunks). 2010 SPECIAL: 20% OFF the listed weekly rate for July, August, September, and October charters, i.e. $16,000/wk plus all expenses for up to 6 guests! How can you resist? Come on down and be pampered! This is an excellent lunch or dinner entrée. I have combined numerous vegetables and textures so that it can be served on its own without additional side dishes. Make the salsa verde by combining the parsley, capers, dill pickles, anchovies and garlic in a bowl, then stir in the red wine vinegar and olive oil. Set aside. Brush the aubergine (egg plant) with some of the olive oil and cook under a hot grill or in a griddle pan until golden brown on both sides. Drain on kitchen towel. Heat a little oil in the griddle pan and cook the dorado fillets until golden brown. 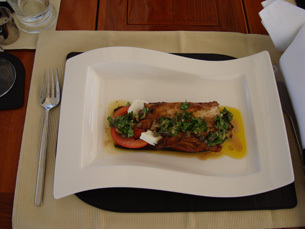 Add the balsamic vinegar to the pan with the fish and cook for 1 minute. 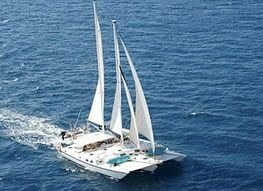 Pacific Wave is available for yacht charters sailing vacations in the Caribbean. 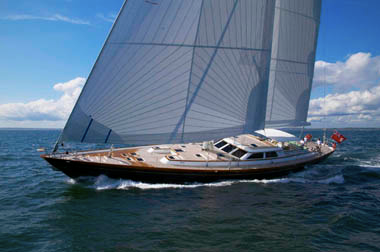 Pacific Wave is a 72-foot sloop with a crew of two. 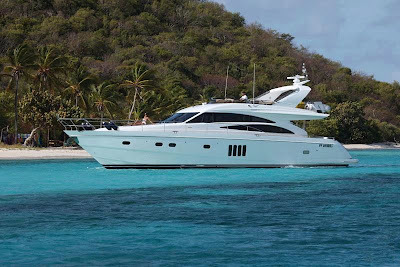 The yacht is fully air conditioned and accommodates up to 6 guests in 3 cabins. 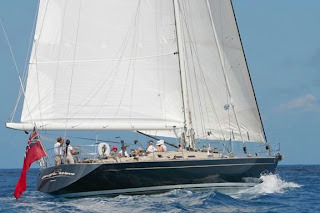 The fabulous charter yacht WHISPER will be available for charter in New England this summer 2010. The magnificent sailing vessel WHISPER is a Ted Hood & Ted Fontaine designed 116-foot Holland Jachtbouw Sloop. Whisper is fully air conditioned, has a professional crew of 5, and can accommodate up to 6 guests in 3 cabins, each with private ensuite heads. 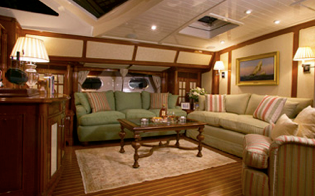 The full-width master cabin is located aft and has a centerline Queen berth. The port guest cabin has a double berth, while the starboard guest cabin has two lower twin berths (not upper/lower bunk beds). Full width salon with dining area. Excellent views from raised pilot house/bar area. 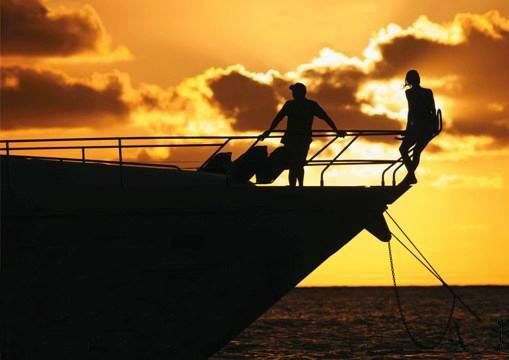 If their summer dates don't work out for you, how about a winter charter? 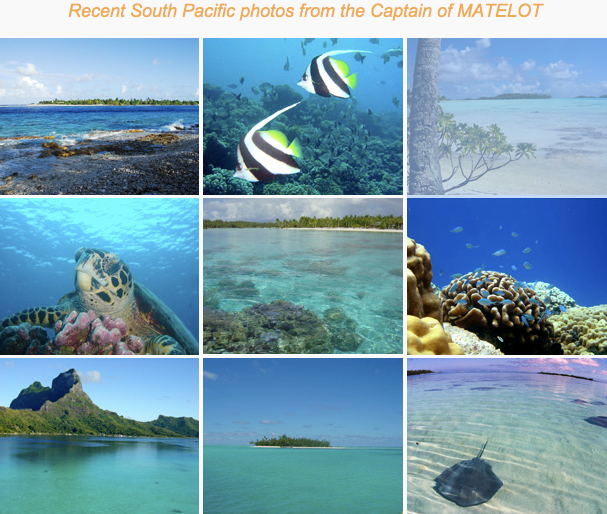 The Charter Yacht MATELOT has arrived in the South Pacific and is ready for yacht charters! MATELOT is a beautiful yacht with luxury accommodations for 6 guests in 3 cabins, offering excellent sailing, an outstanding crew & very attractively priced.